Well it seems that the “Great Volunteer State” has officially volunteered to let their citizens have some vino delivered to their front door step! Praise Jesus! Alleluia! Alleluia! Before that article, I wanted to include some websites so you can enjoy and research the complexities that are the U.S. Wine Shipping Laws! (No amount of wine can make this spiderweb of state wine laws understandable, but heck, it can make it somewhat interesting!) Each state has its own rules! Gotta thank the Prohibitioners! this one is SUPER! very very useful. You can click on each state and have alllll the details on the laws governing direct-to-consumer shipments for wine! A bookmarking must!!! NASHVILLE — Tennesseans may soon be able to order direct shipments of wine from out-of-state wineries. 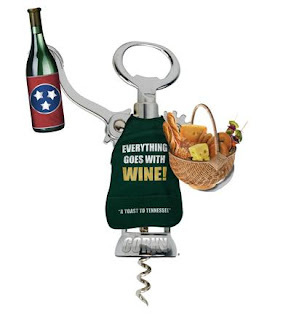 The state Senate voted 22-8 Monday night to approve legislation setting up a system in which out-of-state wineries can register with the state of Tennessee if they wish to ship directly to Tennessee consumers. An individual can order up to one case of wine (up to nine liters) per calendar month and up to three cases (or up to 27 liters) per calendar year from a registered winery. The measure, sponsored by Sen. Paul Stanley, R-Germantown, prohibits shipments to an address in a dry county or municipality and requires an individual 21 and up to sign for the shipment or the carrier cannot leave it. It also requires the winery to pay sales and alcoholic beverage taxes to the state. The bill is scheduled for review Wednesday in the House local government subcommittee. Sen. Roy Herron, D-Dresden, argued against the bill on the grounds that there is little the bill does to prevent alcoholic beverages from reaching minors. Lawmakers are also considering separate legislation to allow wine sales in grocery stores, but that measure is encountering far more opposition from liquor wholesalers and retailers. May your glass always be full of delicious wine!